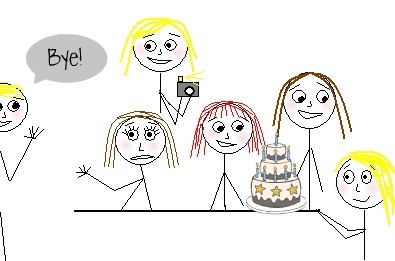 Life in the Pitts: What NOT to do at a slumber party. When I was 5, I had a friend named Maggie. And Maggie had an older brother, who I was going to marry one day. Maggie's brother was named Brian, and he had blond hair. That's pretty much all I remember about him. Well, I also remember the way my heart would start pounding when I heard his name. And that he was really tall (for a 7 year old). One day I went over to Maggie's house for a sleepover birthday party. I dressed up in my cutest outfit (which probably wasn't very cute, since this was 1990) and I let my mom brush my hair for the occasion. I just knew that if I looked my best, there was no way Brian could resist me. I walked through Maggie's front door, and stared. This was her house? I didn't know the word Mansion, but I did know that this house was much bigger than any I had ever been inside. While this impressed me, and kind of made me nervous, it didn't make me want Brian any more than I already did (I have learned a lot since then). "Helena! Welcome. Maggie and the other girls are in the gym." Maggie's mom gestured to a glass wall behind her. And behind that glass? Was a giant room full of gymnastic equipment. In their house. Now, I was little, so the room probably wasn't quite as big as I remember it. 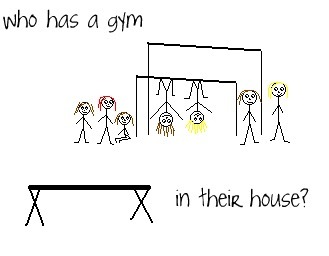 But still- who has gymnastic equipment in their house?? I looked around shyly, but I didn't see Brian anywhere. This was kind of a relief, because my plans were limited to "He will see me, I will look cute, and then we will be in love," and I was starting to worry that it wouldn't be that easy. I dropped my sleeping bag and backpack by the others, and ran to the balance beam. I had taken gymnastics the summer before, and I was anxious to show off my cartwheel-on-the-beam skills. Maybe that would impress him? A few hours later (Or maybe it was minutes? Time passes slower when you are a kid), we gathered around the table to sing happy birthday to Maggie. I knew that her brother would be there for this part, because that's how things worked. Sure enough, he came walking in with his dad and another boy from school. I watched him smile at his mom, and say something funny to his friend. Someone handed me my plate, and I started eating the cake without really tasting it. I couldn't stop staring. This was it. This was the moment I had been waiting for. Any second now he was going to look over and see me, and then he would be my boyfriend. What will we tell Maggie? I wondered. I hope she won't get mad. I smiled extra hard at her, because we were about to become family, and I wanted her to know that I was happy about that. We will probably have 90 kids, I thought. And all of them will be girls. I wonder how old you have to be to get married? I was so busy planning our reception, it took me a minute to realize that Brian was walking out the door. "Have fun spending the night at Jamie's house!" His mom called after him. But, we hadn't even fallen in love yet! We never even made eye contact (despite my constant staring). I was crushed. I wanted to cry, but at the same time I didn't want the other girls to think I was a baby. And the last thing I wanted was to have to explain why I was sad. The rest of the evening passed in a blur. I probably had fun, but I don't remember any of that. I just remember laying down in my sleeping bag that night, on their thick white carpet, and thinking that life was awful. ...and then I noticed that that warm spot was getting cold, and kind of sticky. Oh no, was that pee??! I sat up in a hurry, and felt around beneath me. Sure enough, I had wet the floor. I didn't know what to do! Should I wake up Maggie, or go get her mother?? I just wanted to go home. Heartbroken, I started crying. Not only had my future boyfriend forgotten to fall in love with me, but now I was going to be made fun of at school for the rest of infinity. Maybe infinity times infinity. My little chest heaved with sobs as I climbed out of my sleeping bag. I looked around for my backpack, which had tomorrow's clothes inside. My face was still dripping with tears as I took off my pajamas, and pulled up my jeans. At least I was dry. I looked around the room, trying to decide what to do. I knew I should probably wake up Maggie's mother, but I was too embarrassed. If only I could pretend like nothing happened. The next morning, when Maggie's mom walked in to wake us up, she found all the girls still inside their sleeping bags. I was already dressed, with my sleeping bag all rolled up. I had fallen asleep leaning against it. "Wow, you're all ready. Good for you." She didn't even notice the yellow spot on her expensive white carpet. I had pulled it off! I couldn't believe it. This was the best party ever. As soon as I got home, I ran to my sister Amber. "You'll never guess what happened! They have a trampoline and a balance beam and all kinds of gymnastic stuff RIGHT IN THEIR HOUSE, even some uneven bars and I did a cartwheel and Brian was going to fall in love with me, but he left with a friend, and I'm not even his girlfriend but I still love him and OH MY GOSH I wet the bed, except it was the floor, and I hid it and no one knows and there's a yellow spot but i didn't get caught and it was the BEST PARTY EVER!" Her reaction was kind of anticlimactic. 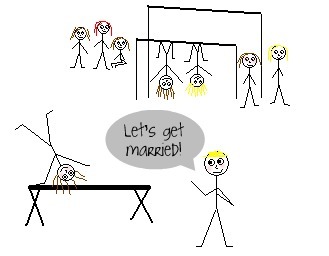 I never did end up marrying Brian, mostly because we moved away a few months later, and he hadn't seen my cartwheel yet. I think things would have ended differently if he had. I still think about that house sometimes. Who has gymnastic equipment in their living room? Your story of potential love lost is amusing, but you know why you didn't get Brian? It wasn't that he didn't see your cartwheels, or he was able to perceive your stares, or that you peed the carpet. It's because your class picture doesn't have lasers in the background. Everyone knows having lasers in your background made you 76% more desirable. My heart, and my bladder, just aches for you! If only he could see you and your Quadraboob now. You poor thing. But now I'm a mom and my daughter is 5 and if she's invited to a sleepover or in love with a boy I'll have a nervous breakdown. Oh how perspectives change! So so so so sooooo Cute! Loved the drawings too. Always wanted a daughter and had sons (and grandsons) instead. They don't have cute stories like this. Their stories involve spiders, frogs, and rotten peanut butter and jelly sandwiches stuck in a dress-up shoe intended for church. 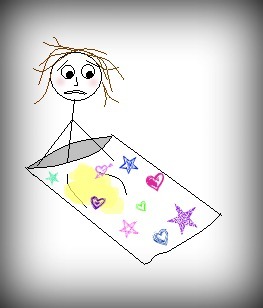 One of my younger sisters had a bed-wetting problem, but as far as I can remember I didn't. Why do I have a very strong feeling that this may become an Anne Hathaway and McDreamie movie? You make me laugh. Another classic could-have-been-love-stories. i mean it has everything. blond boy, cute girl, gym in home, slumber party, pee. what else could you ask for more. 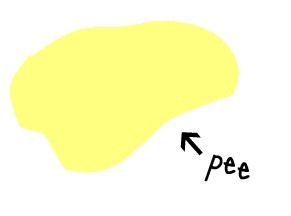 Nice job hiding the pee evidence! Gym equipment in the house? That is amazing! I've never heard of that. They must have been ultra rich. I've just been perusing your blog, Ana Paula from Get Craftin' recommended it to me and I really love it. I'm a new-ish blogger and I love your style of blogging! I started blogging to tell my funny/ embarrassing stories and I'm glad I'm not the only one whose childhood was filled with embarrassing moments! Awkwardness is a gift I say. Hilarious! Not only did you do something totally embarrassing, but you hid it like a pro. "What Not To Do At A Slumber Party" seems way too modest. i wouldn't worry about it (the pee, the long lost love, of course) cuz if they were THAT rich, they probably had a carpet cleaner on staff anyway. What an adorable story! The whole thing was so cute, I totally remember feeling that way about a boy. How simple crushes were in our younger ages. Visiting from LBS! Firstly, thank you so much for your lovely comment on my blog. Secondly, what a fab story....not that you wet the floor was fab but it really conjures up the hopes and thought of a child. Really good. LOVE this. I am here from the Lady Bloggers Society. Definitely following you. 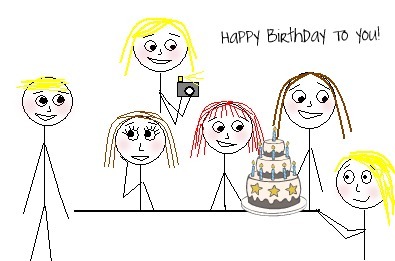 I've never met a blogger who was so talented at the digital stick figures! There was a boy I loved once. I was 4 and he at crayons. So I ate crayons to impress him. He wasn't impressed. And then he moved away. Life is so unfair. Oh man.. I remember the worst sleep over ever. I might post about that. lOL. 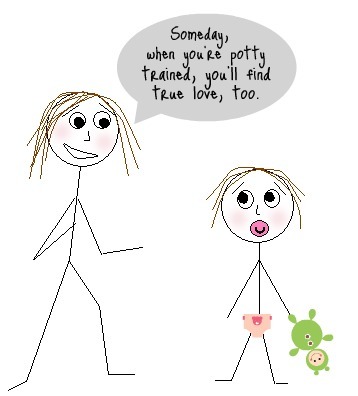 I love your post...especially the stick figures. I'm from the Lady Bloggers Tea Party and I will be following. I had a bedwetting issue in my elementary days but thank gosh I never did it over a friends house....lol. I would have been sooooo terrified if I had pee'd on a white carpet. Luckily they didn't have a dog because I think it may have outed you. Dropping by from the Lady Blogger Tea Party. What a great story and I love the pictures!I look forward to reading more. I LOVE this. What a great story. My heart totally melted when I read this story. I love it. and Thanks for telling me about the pee. i had no idea what the yellow was. True love, no puppy love.